Prepare the crust: Preheat the oven to 375°F. Line your mini cupcake molds with the small liners. Combine the ground graham crackers, melted butter and sugar in a small bowl. Mix using a fork until everything is well combined and moist. Place 1 tablespoon of the mixture at the bottom of each lined mold. Apply light pressure to create the crust. Bake for 5 minutes to compact. Remove from the oven and set aside. For the raspberry purée: Combine the raspberries and sugar in a blender or food processor. Process until soft. Strain the mixture through fine mesh to eliminate the seed. Set aside. Cheese filling: Whip the cream cheese at medium-high using a hand mixer until it becomes fluffy, about 5 minutes. Add the sugar and continue whipping. Add the salt and vanilla, mix until combined. Add the eggs one at a time, mixing well after each addition. Assembly:Pour 2-3 tablespoons of the mixture over the cookie crust. Place 1/2 teaspoon of raspberry purée in a few different spots on the surface of the cheese. Use a toothpick to create a marbling effect. Bake until the filling is firm, about 20 minutes. Transfer to a rack and let cool at room temperature. Refrigerate for at least 2 hours. You can make the purée with any fruit you like. Make the ground graham crackers by placing them in a blender and process until they've completely broken down. 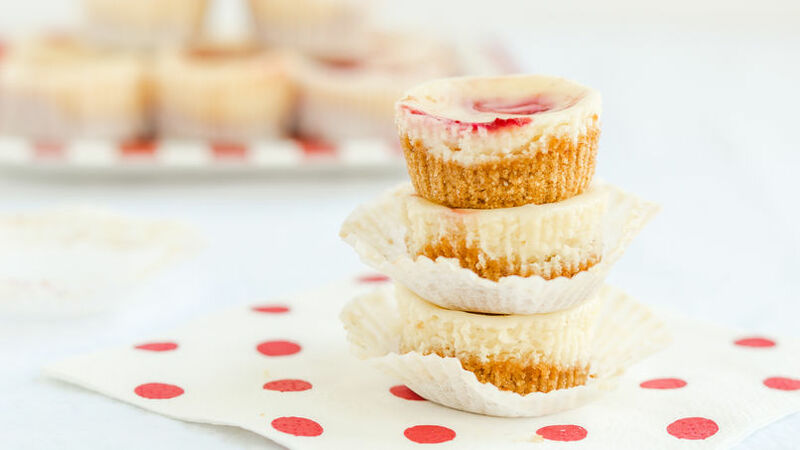 You won't believe how delicious these mini cheesecakes are until you try them! The creamy cheese filling is mixed with a raspberry purée to make an irresistible combination. Their small size makes them perfect for reunions or parties. Enjoy!